A relative newcomer to the competitive email service provider (ESP) market, SendPulse has nevertheless managed to cut out a distinguished niche within the industry. Their notable clients include Swatch, Radisson Blue, and Template Monster. SendPulse offers a host of great features and benefits, having one of the best free plans in the industry. It also delivers on usability, having one of the easiest learning curves you’ll come across for this kind of service. The straightforward UI, however, hides some fairly powerful tools that can be used to grow your email lists with a minimal amount of effort. SendPulse has a variety of pricing plans to choose from: 1 free plan, several list-based plans and pay-as-you-go plans, and 1 VIP plan if you have more than 1 million subscribers. SendPulse’s free plan doesn’t require you to enter your credit card details which is always refreshing. The free plan allows you to send 15,000 emails/month to up to 2500 subscribers. If you exceed the number of subscribers, you’d have to upgrade to one of the paid plans listed below. If you don’t send too many emails, SendPulse’s prepaid email packages give you the option to pay only for the emails you need. The only way to succeed in email marketing is by growing your email list. And with SendPulse, you can easily create subscription forms, place them on your website and start growing your email list. SendPulse allows you to create professionally-designed subscription forms through their easy-to-use drag and drop feature. It’s simple and fun to use, and once you’re done, you can integrate the form onto your website and start growing your contact list. 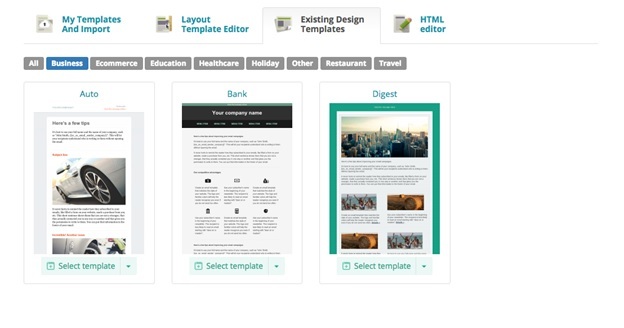 SendPulse offers its users a plethora of professionally-designed responsive email templates to choose from. The email templates are organized into categories, some of which are tailored to specific industries such as E-commerce, Education, Travel, etc. This feature really sets SendPulse apart from some of the other ESPs in the market. Push notifications allow users to get notifications on their desktop whenever you update content on your website, a great way to increase traffic to your site as well as attract unique visitors. 2. Next, enter the URL of your website. It's recommended that you have an SSL certificate aka HTTPS enabled on your website. 3. Next, you'll need to integrate push notifications on your website. Just follow the instructions on the screen to enable push notifications on your website. A/B testing or split testing allows you to measure the effectiveness of your emails and improve your results based on your subscribers’ preferences. This is one of most underutilized features in email marketing, but one that has maximum benefits when executed well. SendPulse offers this feature even under their free plan, unlike most ESPs. It has a bit of a learning curve involved and we advise you to click here to learn more about how A/B testing works on SendPulse. In addition to these features, SendPulse also offers features such as analytics and reporting, autoresponders, resend to unopened feature to boost open rates, integrations with other services, and more. SendPulse is a solid email marketing software. It is easy to use, has some awesome features, and is competitively priced. Its free plan is probably the gold standard in the business for anyone who wants to utilize email marketing, particularly small business owners and professional bloggers. If you’re a small business owner or a blogger looking for a simple, yet efficient email marketing software with a host of great features, SendPulse is an excellent choice.